I was visually struck by the looming wall surrounding this set of renowned pictographs in Utah's Horseshoe Canyon. In order to isolate these pictographs and maximize the wall, I situated the camera quite close to the subject and utilized a wide-angle Schneider 121 super-angulon lens (I understand that this would be impossible today as a protective fence has been placed around the pictograph area). The pictographs themselves are somewhat reddish in color. In an effort to obtain maximum separation of the rock and the pictographs, I applied a deep green gelatin filter and gave the Tri-X film Normal +1 development in HC-110. The negative requires at least a strong grade 3 or grade 4 paper in order to achieve my intended print. The black cracks in the rock, being of utmost importance in this image, are intensified by a carefully planned SCIM mask. 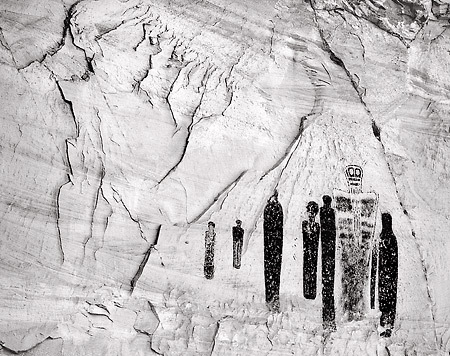 The image is intentionally printed high-key, allowing the black, ghost-like figures and the accompanying lightening-like cracks to have maximum impact. The recent 2010 movie 127 Hours was filmed in this outstanding area.